With the latest Ice Cream Sandwich 4.0 operating system and brilliant 4.65” HD Super AMOLED screen, the Galaxy Nexus is without doubt the next-generation Android smartphone. New applications, such as Face Unlock for extra security and Android Beam for enhanced content sharing, will utterly blow your mind. The curved and stylish design also packs in a powerful 1.2GHz dual core processor for PC-like performance while on the go and a 5mp camera with fast image, panoramic shot and HD video recording. The Galaxy Nexus - Simple. Beautiful. Beyond smart. FAST & POWERFUL performance Expect outstanding performance from a powerful dual core processor - everything from faster connectivity and web-loading, seamless multitasking, softer UI transitions. HSDPA delivers incredibly fast data speeds so you can get your content sooner and enjoy videos, movies, music and games in a flash. HD Super AMOLED Enjoy a sensational screen experience with HD Super AMOLED(1280 X 720) , a cutting edge high-def screen with the brightest and most vivid colours that burst from the frame . Providing crystal clear images for enhanced viewing experience of all your pictures, videos and webpages. Enjoy a real movie experience in ideal 16:9 full screen ratio. First android 4.0 ICE CREAM SANDWICH with Simple & Beautiful UI GALAXY Nexus is the world’s first device outfitted with the “Ice Cream Sandwich” OS. Users will be the first in line to enjoy the cutting edge user interface and new applications as you launch on Android Market. Android’s latest UI starts at the new homescreen outfitted with 360 degree Action Bar and fresh interactive widgets in an exciting holographic environment. Personalisable Screen Lock, font resizing and data usage checks that allow you to fully control and customize your handset. Single motion Panoramic Camera with zero shutter lag With GALAXY NEXUS you get a high-end camera, automatic focus, top notch low-light performance and a simple, intuitive way to take panoramic pictures. With Zero Shutter Lag users can truly capture the moment that happens in an instant. Improved Zoom-in provides larger, clearer previews and sharper close-up shots. Excellent HD Video Recording with anti-shake video stabilization for smoother on-the-move shooting, video snapshot and real-time filters and effects give you more options to seize that special shot. Adding to your convenience, you can edit and then share them right from your phone. Google + Hangout With Google+ built in, sharing the right things with the right people is a lot easier. with Hangouts you can now video chat with up to 9 people wherever you are. Google + includes Circles (selected group), Huddle (group chat), Stream (live updates), Photos (instant upload to cloud) . Or just log onto Google Talk, Gmail, email, SMS and Google Voice. Face Unlock & Android Beam With Face Unlock on Galaxy Nexus you can now unlock your phone with a smile. No complicated passwords to remember, just switch on your phone and look into the camera to quickly unlock your phone. With Galaxy Nexus you can now easily share contacts, websites, apps, maps, directions and YouTube videos to other people close by. Simply hold two NFC enabled Android phones close to each other and touch to beam and share. Please read the product description carefully for all unlocked cell phones. Some unlocked cell phones sold by Newegg may have previously been locked to a specific carrier. A carrier-locked cell phone may often have carrier-specific applications and branding. Some of these applications cannot be unlocked and/or may not function with a different carrier. Also, applications requiring a data plan may result in data usage charges from the original carrier. In addition, the cell phone box may arrive unsealed and the cell phone may appear previously handled. The unlocking procedure requires unsealing the box and manually handling the cell phone. In this case, the cell phone should not be considered "tampered with" or "defective". 5.33" x 2.67" x 0.35"
Pros: This is a nice phone when it works. Cons: The WIFI went out on this phone after 9 months of light use. The phone never got dropped and never got wet. Cellular data continues to work, but the phone cannot find any WiFi access points. When WiFi is on, the phone overheats and then powers down. With WiFi off, the phone can be used. Other Thoughts: I expect a phone to last at least year. Poor quality, defective workman ship. Will not buy another phone without a one-year manufacturer warranty. This should not simply stop working int the first year. The phone was too expensive to have such poor quality. Pros: I got this defective device from NewEgg. I sent it back for reviewing defect. But NewEgg customer support sent it back to me saying it's not defective. Even a blind person can easily figure out the issue with this device. I am not sure what technical analysis NewEgg team did. Now I am running behind NewEgg Customer Support since a week and nobody is answering me. I am writing e-mails, calling them, posting on their portals and nobody is answering me. This seems like they did a fraud with me and now they don't want to get my money refunded. I am highly disappointed and now looking for other options to get my money back. Can someone please help me with this? Cons: I got this defective device from NewEgg. I sent it back for reviewing defect. But NewEgg customer support sent it back to me saying it's not defective. Even a blind person can easily figure out the issue with this device. I am not sure what technical analysis NewEgg team did. Now I am running behind NewEgg Customer Support since a week and nobody is answering me. I am writing e-mails, calling them, posting on their portals and nobody is answering me. This seems like they did a fraud with me and now they don't want to get my money refunded. I am highly disappointed and now looking for other options to get my money back. Can someone please help me with this? Samsung couldn't find my "IMEI" number on the phone and wanted 3 days to see if it was serviced by samsung USA. 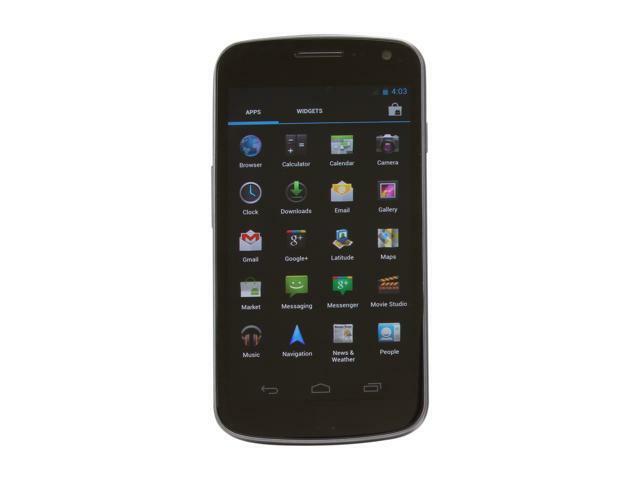 Pros: Its a very good smartphone, if you want to buy an android phone buy a nexus one. dont waste time in others android phones. Cons: its ok for me. Pros: It's in very good condition. Cons: It's LOCKED, don't believe the title!!! It's locked!!! Pros: This is a thin phone that is just the right size. The 4.65" screen is gorgeous and a very big upgrade from my previous phone the Motorola Defy. The dual-core processor is leagues faster and stock Android is a very big plus since Google Nexus devices are first to get the latest version of Android. I've already upgraded to Jellybean and it's the fastest and slickest version of Android yet. I also enjoy 4G-like speeds with HSPA+ support versus the stadard 3G support I had with the Motorola and it's like night and day. Battery life has been pretty good for me as well. Samsung and Google have really put together an excellent device. Cons: It's not the Nexus 4!! Other Thoughts: I was originally planning to get the Nexus 4, but I had no idea that it was going to sellout within minutes, and of course there's a long back-order on them. My old phone was getting quite a bit long in the tooth, and I was already tired of waiting. T-Mobile refuses to give me a reasonable price on an upgrade phone even though I have just 9 months remaining on my 2-year contract which I didn't even get a new phone with in the first place! I refuse to pay $500-650 for a phone. They were even gonna charge me $500 for the Nexus 4...RIDICULOUS!!! I figured the Galaxy Nexus was the best alternative and it turns out I was right. Sure I would prefer the new Nexus with quad-core CPU and Super LCD but the dual-core CPU and AMOLED screen on the Galaxy Nexus are still excellent performers. For those who can't get their hands on the Nexus 4 and can't stand the wait then this is still a great alternative and of course Newegg is the only place that has it at this price. Also, stock Android is awesome. None of that silly TouchWiz and whatever other customizations that the various manufactures can come up with is on the Nexus line of phones. No need to root these phones just get your hands on the latest version of Android. Google supports all Nexus devices, so you're not left being at the mercy of the other companies. It amazes me how fast some of these companies abandon support for the phones. I think all of my future phones will be Nexus products since I can count on getting future updates. I've even ordered a Nexus 7 tablet which I'm currently waiting on. Anyways...this is the second best deal out there for a high-end unlocked phone and even though its been out a year its still a rather impressive device. I initially wanted an SIII or a Note II, but I'm extremely happy with my Galaxy Nexus. I have several friends with SIII's and after messing around with those phones I feel like I got the better all-around device. My phone is just as fast, it feels better constructed, and stock Android is the best. I'm sure the Note II is great, but I wasn't paying $650 and the size of it doesn't make for a nice fit into pants pockets either. So...it's the Galaxy Nexus if you can't get your hands on the Nexus 4. You'll will be more than satisfied. Pros: Nice, solidly constructed feel, even if it is mostly plastic. Doesn't have the same cheap, creaky feel the original Galaxy S and Galaxy S2 had. Super AMOLED screen is as brilliant as always, and the bluish hue on white backgrounds that earlier AMOLED screens has largely been corrected. Reception, both 3G and wifi, is better than the Galaxy S. For those of you using T-Mobile, the Nexus supports the 21Mbit HSPA+ standard. Sound quality is okay, but not overly loud, especially on speaker. Jellybean (Android 4.1.x) has been out for the Nexus for a while now, and does address a lot of issues people had with Ice Cream Sandwich like OS lag. Since the phone is a "pure" Google device, you'll be the first to receive OS updates (Android 4.2 is coming soon), which is a definite bonus. The camera is also an improvement over the Galaxy S I had, bringing much faster shutter time, faster autofocus/face recognition, etc. The LED flash can be useful, but tends to blow out pictures. It's more purposeful as a flashlight, usually. Samsung also thought to include an actual LED notification light at the bottom of the phone, which was an annoyance I had with the Galaxy S, which had no notification lights. Browser speed and multitasking is much improved over earlier single core model phones, even though the hardware in this phone isn't cutting edge anymore. With Jellybean, at least, battery life seems quite good. Much improved over my old Galaxy S, though I have rooted the phone and installed a custom ROM and kernel. As a pleasant surprise, the GPS works quite well on this phone. Samsung has had issues with GPS drivers in the past, but it seems those days are behind us. Fast lock times, pretty high accuracy, and support for GLONASS. Cons: Camera is okay, but nothing to write home about. Don't get hung up on megapixel count because it really doesn't matter if the manufacturer uses low quality optics. The 5MP sensor in this phone is completely usable, but suffers in low light environments as do all phone cameras. Even at the highest volume, the speaker still isn't very loud. This can be remedied by an application from the Play store called Volume Plus, if I remember correctly. Not really a great device with Android Ice Cream Sandwich, but Jellybean addresses most of those issues, and comes as an OTA update as soon as you power on the phone. Other Thoughts: Newegg's jacked the price back up to $700, which is odd considering it was going for $350, same as from Google Play and other etailers. Don't buy this phone at $700.